Question: What is The Beatles' best album? Did you say Sgt. Pepper's Lonely Hearts Club Band ? Wait, you said The Beatles (aka The White Album), right? What if I told you I thought Revolver was at least as good as those two, maybe better? Would you think me mad? Hear me out. 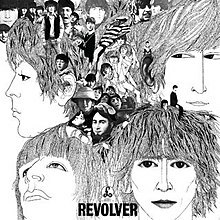 Revolver was The Beatles last studio project before retiring from live performances altogether. As such, they were free to explore the most advanced recording technology of the time without giving pause to consider how they might recreate these soundscapes live. This is the approach that gave us the surreal "Tomorrow Never Knows", the backwards guitar solo in "I'm Only Sleeping" and the seafaring silliness of "Yellow Submarine". Some really great things on this album fly under the radar. I'm sure everyone knows "Eleanor Rigby", but few know that Paul McCartney insisted on "close-miking" the string instruments (violins, cellos etc.) to achieve a bold, more biting sound. A subtle difference to some, but not so subtle for the members of the string octet. Irish whiskey seems to share the fate of Revolver when it comes to whisky enthusiasts' preferences. Single malt scotch and bourbon dominate while Irish Single Pot Still gets relegated to also-ran status. This, like the under-appreciation of Revolver, is unfair. 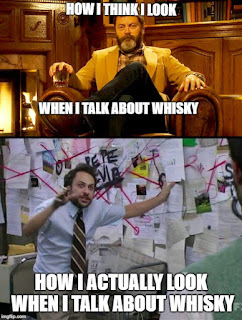 Irish Single Pot Still has so much going on, it's just not as well known as Sgt. Pepper's, er, I mean single malt scotch. And in the sweet, rich world of Irish Single Pot Still, there are some not-so-subtle whiskies that really give you a more "biting" experience. Enter Redbreast 12 Year Old Cask Strength whiskey. Redbreast is the largest selling Single Pot Still Irish Whiskey in the world. A significant number of Irish whiskey lovers consider it the definitive expression of traditional Irish Single Pot Still. The whiskey was originally a product of W & A Gilbey, a London-based company. When Gilbey's started to gain some measure of repute, they expanded to Dublin as "wine-importers and distillers". They later started selling some of their ex-sherry casks to Irish whiskey makers John Jameson & Sons. Jameson filled these sherry casks with Irish whiskey which was shipped back to London for storage, or stored in their Dublin bond-houses. The first official mention of "Redbreast" was in 1912, when Gilbey's referred to the sale of "Redbreast" J.J. Liqueur Whiskey 12 Years Old whiskey. "Redbreast" being a nickname given to one of their whiskeys by Gilbey's then chairman, an avid birdwatcher, in reference to the robin redbreast. In 1968, Irish Distillers (owners of Jameson) opted to phase out the supply of bonded whiskey to merchants such as Gilbey's. This threatened the future of the whiskey brand, as Irish Distillers controlled all of the whiskey distilleries in operation in Ireland at that point. However, after many pleas from Gilbey's, and a few good donnybrooks (allegedly), Irish Distillers agreed to continue to supply distillate for the production of Redbreast.The last bottling of Redbreast under the Gilbey's banner occurred in 1985. In 1986 Gilbey's, who had long since stopped maturing Redbreast in their vaults in London, entered into an agreement to sell the Redbreast brand name to Irish Distillers. What is Irish Single Pot Still? Pump the brakes: Gus N Bru isn't a real whiskey ! 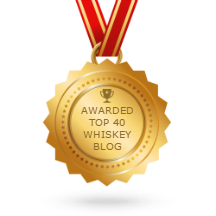 In case you've forgotten (or haven't read) my review of Fionnan O'Connor's excellent treatise on Irish Whiskey (A Glass Apart), Irish Single Pot Still Whiskey differs from Single Malt Scotch mainly in the type of barley used. While single malt scotch uses only malted barley, Irish Single Pot Still uses a combination of malted and unmalted barley. This practice was started (or at least popularized) when the English started taxing malted barley in the 18th century. The Irish, always one step ahead, decided to reduce their costs by adding unmalted barley to the mashbill. The result was glorious. Irish Single Pot Still is rich, oily and spicy. 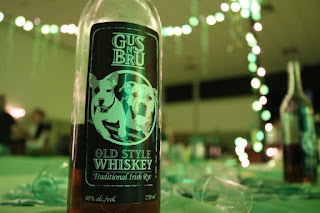 If your only experience with Irish whiskey is doing shots of Jameson on St. Patrick's Day the way Wayne, Squirrely Dan and Daryl shoot Gus N Bru on Letterkenny, you need to try some single pot still. To be fair, (to be faa-ii-hhr) you wouldn't judge The Beatles' legacy strictly on the strength of "Love Me Do" now would you? Of course not. Figure it out. Cask Strength means there is no water added to the whiskey before bottling. This whiskey comes out of the cask at 57.2% ABV and goes in to the bottle at the same proof. This means bigger, bolder flavour. Think of it as "close-miking" the whiskey. It is not for the faint of heart, and it may feel like a punch in the mouth to the uninitiated. To those who enjoy bold flavours, cask strength whiskey makes us feel like Kevin Malone opening a candy bar. Finish: Woah ! There's that Cask Strength alcohol burn. But the burn subsides fairly quickly and leaves rich brown sugar, buttered toast and a nice oakiness. Adding water really opens up this whiskey. It's still powerful (I dilute it to about 50% ABV) yet the flavours become clearer. Freshly baked cinnamon buns with toffee come to mind. More orange and ginger. Rich, sweet dates on the finish remind us that this was aged entirely in first-fill Oloroso Sherry casks. This is simply terrific whiskey. A great many things are unfairly overlooked. Beatles albums, CraveTV's Letterkenny (if you haven't seen this show yet, you have to watch it. The writing is just brilliant) and Irish Single Pot Still whiskey. 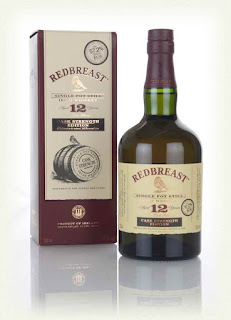 Redbreast 12 is pretty iconic among those in the know, but the Cask Strength version is flavour dialed up to eleven. I find it impossible to say anything bad about this whiskey. Every time I have a tipple of it, I'm elated yet sad. The elation obviously stems from the glory of the whiskey, but the sadness stems from the stark and sudden realization that this bottle is a bit closer to being empty. Fortunately, Irish Whiskey seems to be slowly experiencing a resurgence, so this beauty should be available for the long haul. Highly recommended ! If you enjoyed this post, please share or leave a comment !